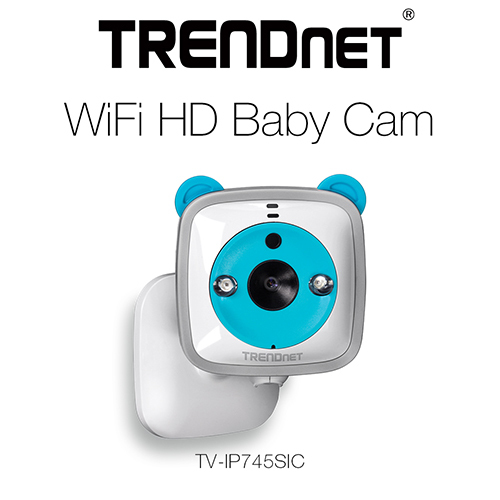 TORRANCE, Calif. – Dec. 29, 2014 – TRENDnet, a best-in-class wired and wireless networking hardware brand, today announces the availability of the WiFi HD Baby Cam, model TV-IP745SIC – which makes it easier than ever to monitor your baby, pets, or home from any internet connection. After a brief installation using a mobile device, users open the free CloudView app from any internet connection, to view HD video on Apple and Android devices. An articulated, extendable, and integrated mounting base facilitates camera installations on walls or flat surfaces. Integrated Wireless N allows users to place the camera in the optimal location within a wireless network. The TV-IP745SIC comes with many powerful features. 720p HD video captures more with a wider viewing field. Powerful night vision provides clear visibility in complete darkness for distances of up to 24 feet or 7.5 meters. Users can set the camera to email video clips of activity triggered by motion or sound. With two-way audio and a built-in speaker, users can talk through the camera using their mobile device. The TV-IP745SIC comes with 5 soothing classical songs, which can be played from the free app or by pressing the play button on the top of the camera. There’s also a handy built-in thermometer which can trigger an alert if the room temperature gets too hot or cold. Users can program the camera to record video to a network attached storage device or to a MircoSD card (sold separately). A weekly recording schedule can be created with varying continuous recording and motion detection recording timeslots. A 32 Gigabyte MicroSD card records two and a half days of continuous 720p HD video or over one week of motion detection video. About TRENDnetTo learn more about and connect with TRENDnet, visit www.trendnet.com/company, www.facebook.com/TRENDnet, www.twitter.com/trendnet, and www.youtube.com/Pixelpro80.